Peritoneoscopic insertion, which is now, most often, performed by nonsurgeons, employs a small (2.2 mm diameter) optical peritoneoscope (Y-Tec® Scopea) for direct inspection of the peritoneal cavity and identification of a suitable site for the intraperi-toneal portion of the catheter (11,13-21). Hence, of the three techniques described so far, only the latter allows for the direct visualization of the intraperitoneal structures. This technique is most commonly used by nephrologists and its use is rapidly expanding. Peritoneoscopic placement varies from laparoscopic techniques, which will be elaborated on below (22,23), because it employs a much smaller scope and puncture size, only one peritoneal puncture site, a device to advance the cuff into the musculature, air in the peritoneum rather than CO2, and local anesthesia rather than general anesthesia. For peritoneoscopic insertion, the entire abdomen is prepped and draped in sterile fashion. A small skin incision (2-3 cm) is made over the desired location under local anesthesia (11). Dissection is carried down only to the subcutaneous tissue. The anterior rec-tus sheath is identified but not incised. A preassembled cannula with trocar and a spiral sheath is then inserted into the abdominal cavity through the rectus muscle (Fig. 2). Either medial or lateral border of the rectus could be used to gain access to the peritoneal cavity. The trocar is then removed and replaced by the peritoneoscope to confirm the intra-abdominal position of the cannula. Approximately 600 to 1000 cc of air is then infused to create a pneumoperitoneum and separate visceral and parietal peritoneal surfaces. At this point, peritoneoscopy is performed (Fig. 3). Bowel loops, the dome of the bladder, and the presence or absence of intra-abdominal adhesions are identified. The cannula with the spiral sheath wrapped around it is then advanced to an identified location (usually in the pelvis). The cannula and the peritoneoscope are then removed, leaving the spiral sheath in place. The spiral sheath is dilated to 6 mm diameter and the catheter is advanced into the desired location through the spiral sheath using an internal stylette. The deep cuff is implanted into the rectus muscle using an implanter tool without dissection of the anterior rectus sheath or the muscle. Some secure the deep cuff into the rectus muscle by using a purse-string suture at the anterior rectus sheath. The superficial cuff is implanted into the subcutaneous tissue and a tunnel and an exit site are created (Fig. 4). The tunnel and exit site are routinely directed inferiorly. The subcutaneous tissue is sutured using absorbable material while the skin is closed with nylon. No sutures are placed on the external rectus sheath or at the skin exit site. The ability to directly visualize intraperitoneal structures is advantageous to the catheter placement (15,16,18). With this approach, the surgeon can avoid bowel loops, adhesions, and the omentum and determine the most suitable site for catheter placement. In this technique, neither the rectus sheath/muscle nor the parietal peritoneum aMedigroup, Naperville, IL. FIGURE2 ■ During peritoneoscopic insertion of a peritoneal dialysis catheter, a trocar and cannula, with its wrapped spiral sheath, is being inserted through the rectus muscle under local anesthesia. FIGURE 3 ■ A peritoneoscope (single arrow) has been introduced into the abdominal cavity through the cannula and the fibro-optic light (double arrow) source is being connected to the scope. The preference of one technique over another must take into account the incidence of complications (peri-catheter leakage, exit site and tunnel infection), long-term catheter survival associated with each technique, costs, ease and timely insertion of the catheter, and factors contributing to mortality risk (general anesthesia). is incised, and the initial puncture is only about 3 mm in diameter. Thus, the layers of the anterior abdominal wall remain intact and tightly opposed to the catheter and cuff after placement. The preference of one technique over another must take into account the incidence of complications (pericatheter leakage, exit site and tunnel infection), long-term catheter survival associated with each technique, costs, ease and timely insertion of the catheter, and factors contributing to mortality risk (general anesthesia). FIGURE4 ■ Using a disposable tunneler tool (straight arrow), a subcutaneous tunnel is created for the catheter. The superficial cuff shown (curved arrow) will be implanted in the subcutaneous tissue. of various complications by peritoneoscopic placement may relate to the decreased tissue dissection required with this technique. Extensive dissection (incising/splitting the rectus sheath/muscle as well as incising the parietal peritoneum) in the surgical technique may lead to loose attachment of the catheter to the abdominal wall increasing, thereby, the incidence of pericatheter leaks, subsequent tunnel infection and peritonitis, and catheter loss. Laparoscopic management for obstructed catheter was first described in 1985 (41). Since then, a number of authors have reported their success in using laparoscopy to assist the placement or the salvage of obstructed catheters (42-46). 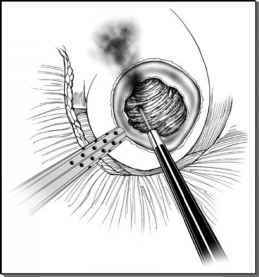 Laparoscopic management for obstructed catheter was first described in 1985. Since then, a number of authors have reported their success in using laparoscopy to assist the placement or the salvage of obstructed catheters. of establishing peritoneal dialysis access as compared with the open dissection technique (22,58).